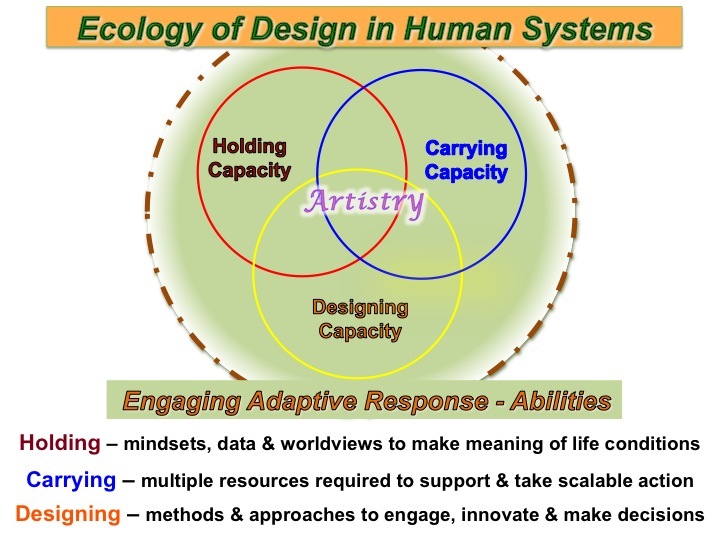 The Ecology of Design in Human Systems (EoD) framework represents the interaction between perspective-taking, meaning-making and intentional action = the core elements to designing for healthy human engagement and creating conditions for health in human systems. Given the various challenges emerging in our social and ecological arenas, becoming able to comprehend and embrace complexity is critical to enhancing our future prospects for health, well-being and, possibly, even our very survival on this planet. 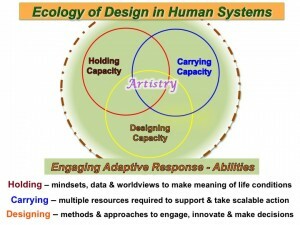 The EoD framework is intended for increasing the ability to take a perspective on complexity and interdependent relationships—a more ecological dimensionality on the “conditions” that contribute to human health and human becoming. We suggest that such a framework contributes significantly to revealing strengths, shortfalls, and gaps informing how we keep getting the results we’ve already gotten AND how we might make decisions to create more of what we say we want. 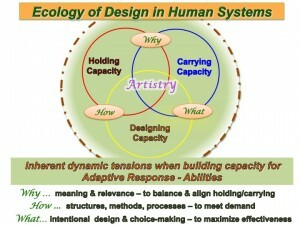 Our premise is that we are always operating within “an ecology” of interdependent relationships, our various “habitats”, that actually necessitates “a mutuality” be held in choice-making and resulting outcomes. Metaphorically, the river of life is always moving no matter where we might choose to view it – or to jump into it. So, no matter where we are, we are already moving, influencing and being influenced by the flow. The EoD framework represents “a snapshot” perspective on any life experience for both individuals and groups, as well as being applicable at any scale of human interaction/organization = self, interpersonal, organization, communities, regions, global. Simply put, the Venn diagram represents the dynamic interplay that occurs whenever we, as human beings, make decisions or consider taking action. This ‘dynamic’ readily shows up whenever we attempt to understand a situation, make sense of a problem, or want to make a change. While simple in design – it is not simplistic. 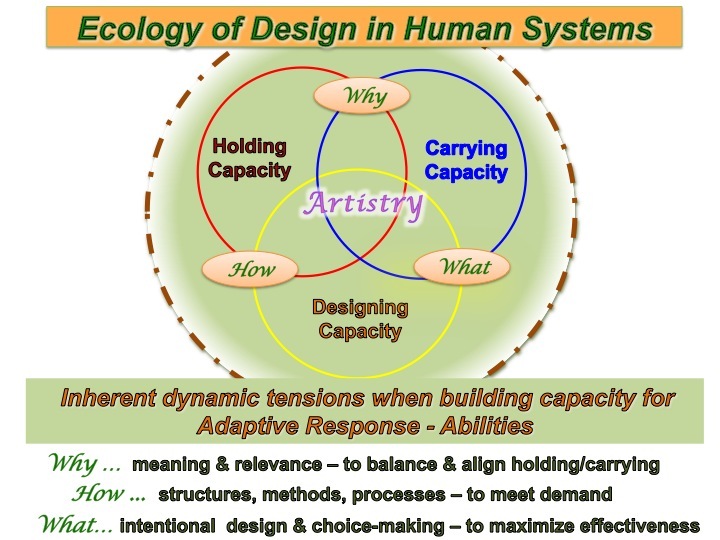 The dynamic relationships across the domains (Holding, Carrying and Designing Capacities) reveal complex, adaptive response-abilities operating by default or by design – each having the potential for promoting integrated, healthy human systems. This framework can be useful in revealing the underlying factors and aspects that influence the intentions and outcomes, both positive and negative, when human beings engage together – making the implicit – what’s going on ‘behind the scenes’ — more explicit. By revealing the domain aspects and their dynamic conditions, it becomes possible – when considering any change – to increase perspective on where the highest leverage point(s) for intervention might exist and, then, also to improve the choice-making abilities for determining the next best actions to undertake. These are simply the Why, How, and What occurring in any situation where human motivation and action occurs for the purpose of creating enduring value. Gaining facility in working with these dynamics can support individuals in any role where they are responsible for the success of others, especially those involved with intentional change initiatives and processes.